"Kashkuh" redirects here. For the villages in Iran, see Kashkuh, Iran. "Ellel" redirects here. For the village in Lancashire, England, see Ellel, Lancashire. "Jarri" redirects here. It is not to be confused with Jari (disambiguation), Jarrie, Jarry (disambiguation), or Jerri (disambiguation). Hittite mythology and Hittite religion were the religious beliefs and practices of the Hittites, who created an empire centered in what is now Turkey from c. 1600 BCE to 1180 BCE. Most of the narratives embodying Hittite mythology are lost, and the elements that would give a balanced view of Hittite religion are lacking among the tablets recovered at the Hittite capital Hattusa and other Hittite sites. Thus, "there are no canonical scriptures, no theological disquisitions or discourses, no aids to private devotion". Some religious documents formed part of the corpus with which young scribes were trained, and have survived, most of them dating from the last several decades before the final burning of the sites.[when?] The scribes in the royal administration, some of whose archives survive, were a bureaucracy, organizing and maintaining royal responsibilities in areas that would be considered part of religion today: temple organization, cultic administration, reports of diviners, make up the main body of surviving texts. The understanding of Hittite mythology depends on readings of surviving stone carvings, deciphering of the iconology represented in seal stones, interpreting ground plans of temples: additionally, there are a few images of deities, for the Hittites often worshipped their gods through Huwasi stones, which represented deities and were treated as sacred objects. Gods were often depicted standing on the backs of their respective beasts, or may have been identifiable in their animal form. Though drawing on ancient Mesopotamian religion, the religion of the Hittites and Luwians retains noticeable elements of reconstructed Proto-Indo-European religion. For example, Tarhunt, the god of thunder and his conflict with the serpent Illuyanka resembles the conflict between Indra and the cosmic serpent Vritra in Vedic mythology, or Thor and the serpent Jörmungandr in Norse mythology. This myth also bears a resemblance to the daily struggle between Re and the serpent Apophis in Egyptian mythology. Hittite mythology was also influenced more directly by the Hurrians, a neighboring civilization close to Anatolia, where the Hittites were located. The Hurrians are so closely related that Oxford University Press published a guide to mythology and categorized them together as “Hittite-Hurrian”. Unfortunately, much of the knowledge about the Hittites has come from artistic, rather than textual, sources, making it difficult to be certain about specific details on this topic. Hittite tablets regarding mythology often date back toward the end of the Old Hittite Kingdom, with significantly fewer sources beyond that. Groups of Hittite documents that are found are called “cult-inventories” and are valuable in learning about how Hittite myth and practice was included in daily life. The gods, the Sun-God and the Storm-God, have entrusted to me, the king, the land and my household, so that I, the king, should protect my land and my household, for myself. "All of the land of Hatti is dying, so that no one prepares the sacrificial loaf and libation for you (the gods). The plowmen who used to work the fields of the gods have died, so that no one works or reaps the fields of the gods any longer. The miller-women who used to prepare sacrificial loaves of the gods have died, so that they no longer make the sacrificial loaves. As for the corral and the sheepfold from which one used to cull the offerings of sheep and cattle- the cowherds and shepherds have died, and the corral and sheepfold are empty. So it happens that the sacrificial loaves, libation[s], and animal sacrifices are cut off. And you come to us, o gods, and hold us culpable in this matter!" Obviously, the preservation of good relationships with deities that were closely affiliated with nature and agriculture, such as Arinna, would have been essential. If the balance between respect and criticism was significantly shifted, it could mean disfavor in the eyes of the gods, and likely a very unlucky harvest season at the very least. Despite this danger, the Hittites mostly communicated with their gods in an informal manner, and individuals often simply made requests of the gods without the accompaniment of rituals or the assistance of priests when the occasion was casual. The Hittites also utilized associations with the divine in a way similar to the ancient Egyptians, using the will of the gods to justify human actions. Because the men of Kaška have taken the land of Nerik for themselves, we are continually sending the rituals for the Storm God in Nerik and for the gods of Nerik from Ḫattuša in the city of Ḫakmišša, (namely) thick-breads, libations, oxen, and sheep. The weather god was identified there with Mount Zaliyanu near Nerik, responsible for assigning rain to the city's croplands. Among the crowd a few stand out as more than local: Tarhunt has a son, Telipinu and a daughter, Inara. Inara is a protective deity (dLAMMA) involved with the Puruli spring festival. Ishara is a goddess of the oath; lists of divine witnesses to treaties seem to represent the Hittite pantheon most clearly, though some well-attested gods are inexplicably missing. His consort is the Hattic solar deity. This divine couple were presumably worshipped in the twin cellas of the largest temple at Hattusa. Sun-Goddes of Arinna, my lady, you are the queen of all lands! In the land of Hatti you have assumed the name of Sun-Goddess of Arinna, but in respect to the land which you made of cedars, you have assumed the name Hebat. Kumarbi is the father of Tarhunt; his role in the Song of Kumarbi is reminiscent of that of Cronus in the Theogony of Hesiod. Ullikummi is a stone monster fathered by Kumarbi, reminiscent of Hesiod's Typhon. The Luwian god of weather and lightning, Pihassassa, may be at the origin of Greek Pegasus. Depictions of hybrid animals (like hippogriffs, chimerae etc.) are typical for the Anatolian art of the period. In the Telipinu myth, the disappearance of Telipinu, god of agriculture and fertility causes all fertility to fail, both plant and animal. This results in devastation and despair among gods and humans alike. In order to stop the havoc and devastation, the gods seek Telipinu but fail to find him. Only a bee sent by the goddess Hannahannah finds Telipinu, and stings him in order to wake him up. However this infuriates Telipinu further and he "diverts the flow of rivers and shatters the houses". In the end, the goddess Kamrusepa uses healing and magic to calm Telipinu after which he returns home and restores the vegetation and fertility. In other references it is a mortal priest who prays for all of Telipinu's anger to be sent to bronze containers in the underworld, of which nothing escapes. Many of the Hittite myths involve a full cast of characters, usually because the problem has widespread effects so everyone gets involved. Usually, the solution can only be found by working together to overcome the issue, although these are less wholesome ethical stories and more action-based epics with an ensemble cast. Another myth reflecting this style of plot is "The Slaying of the Dragon." This myth was recited during New Year rituals, which were performed to ensure agricultural prosperity in the coming year. The myth centers around a serpent (or dragon) that represents the “forces of evil” and defeats the Storm God in a fight. The goddess Inara comes up with a plan to trick and kill the serpent, and enlists a human, Ḫupašiya, to help. Ḫupašiya is, of course, reluctant to assist without some kind of incentive, so he gets Inara to sleep with him before they carry out her scheme. Inara then invites the serpent over and they have a feast, getting so drunk that Ḫupašiya is able to tie the serpent up. The Storm God then steps in and slays the serpent himself. Much like in the Telipinu myth, a human was used to help the gods in their plots, which further emphasizes the familiar relationship between mortal and divine. The mortal doesn't have much of a role in the story, but his presence is a help rather than hindrance. It also highlights the roles that goddesses played, within myth and in life. The powerful gods provoke a fight or do something else to create the central issue of each myth, and then the goddesses clean up after them and solve everything with intellect. Unfortunately despite their helpful interference, nature cannot return to its status quo until the god completes the final step before normality sets in. He must wake up and resume his duties, or kill the beast, or some other action that proves his power is beyond all others. Myths regarding deities that were not originally Hittite were often adapted and assimilated. The Mesopotamian goddess Ishtar (Ištar) was one of the many adopted deities who were assimilated into Hittite pantheons through association with similar deities and adjustments to their myths. Since mythology was a large part of Hittite cult practice, an understanding of Ishtar’s powers and history was essential to the development of rituals and incantations invoking her. Subtle changes like this were also made possible with her absorption/close association of other goddesses, namely Anzili, as well as Šawuška, and Geštinanna. With the personality traits of multiple other goddesses, Ishtar's power grew, as did her popularity. One innovative way that she was utilized was in purification rituals such as Allaiturahhi’s, in which her affinity for the underworld was exploited and interpreted in a way that benefited the reader and cast her as a protector, rather than a victim, as in Mesopotamian myth. Ishtar's relationship with the underworld also made her a valuable chthonic deity, especially when her other affinities for war, sexuality, and magic were considered. The combination of these characteristics greatly increased her influence, as fertility of the earth was one of the most fundamental priorities for the Hittites. The Hittites even recognized that she was fairly prominent in other cultures and created a ritual which "treats her as an international goddess". The differences between outsider deities like Ishtar were respected, even though she had been appropriated for Hittite usage. 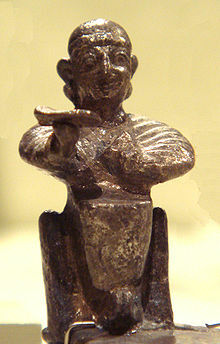 Arinniti – sun goddess, possibly another name for the sun goddess of the city of Arinna. In the late 14th century BCE, King Mursili II was particularly devoted to Arinniti. Ellel – god of the sky. He is invoked in state treaties as a protector of oaths. Jarri – god of plague and pestilence, "Lord of the Bow"
Kaskuh (Kaškuḫ; Kašku) – god of the moon. (Hurrian Kuşuh) The Luwian peoples called him Arma. ^ a b c d e Gary Beckman, "The Religion of the Hittites", The Biblical Archaeologist 52.2/3, (June - September 1989:98-108) noting E. Laroche, Catalogue des textes hittites 1971, and K. Bittel, Hattusa, the Capital of the Hittites, 1970. ^ J. G. Macqueen, '"Hattian Mythology and Hittite Monarchy'", Anatolian Studies (1959). ^ R.Lebrun, "Le zoomorphisme dans la religion hittite," L'Animal, l'homme, le dieu dans le Proche-Orient ancien, (Leuven) 1985:95-103, noted in Beckman 1989. ^ Leeming, David. “Hittite-Hurrian Mythology.” The Oxford Companion to World Mythology. Oxford: Oxford University Press, 2005. 185-7. ^ a b c Ünal, Ahmet. "The Power of Narrative in Hittite Literature." Across the Anatolian Plateau. Boston, MA: American Schools of Oriental Research, 2001. 99-121. ^ a b Cammarosano, Michele. "Hittite Cult Inventories — Part One: The Hittite Cult Inventories as Textual Genre." Die Welt Des Orients 43, no. 1 (2013): 63-105. ^ Quoted in Beckman 1985:101. ^ a b c d Collins, Billie Jean. “Necromancy, Fertility, and the Dark Earth: The Use of Ritual Pits in Hittite Cult.” In Magic and Ritual in the Ancient World, Edited by Paul Mirecki and Marvin Meyer, 224-241. Leiden, Netherlands: Brill, 2002. ^ a b c Bachvarova, Mary R. "Adapting Mesopotamian Myth in Hurro-Hittite Rituals at Hattuša: Ištar, the Underworld, and the Legendary Kings," in Beyond Hatti: A Tribute to Gary Beckman, edited by Billie Jean Collins and Piotr Michalowski. Atlanta, Ga.: Lockwood Press, 2013. 23-44. ^ Burney, Charles Allen (2004). Historical dictionary of the Hittites. Scarecrow Press. p. 28. ISBN 9780810849365. ^ E. Laroche, Recherches sur les noms des dieux hittites, 1947; O.R. Gurney, Some aspects of Hittite religion (Schweich Lectures, 1976) 1977:4-23. ^ a b Beckman 1985:99. ^ V. Haas, Der Kult von Nerik(series Studia Pohl 4), 1970. ^ G. Kestemont, "Le Panthéon des instruments hittites de droit public" Orientalia 45 (1976:147-77)..
^ Coastal Syria is intended. ^ Quoted in Beckman 1985:99f. ^ Jordan, Michael (1993). Encyclopedia of gods : over 2,500 deities of the world. Internet Archive. New York : Facts on File. ^ Hans Gustav Güterbock, An Addition to the Prayer of Muršili to the Sungoddess and Its Implications, Anatolian Studies (1980).